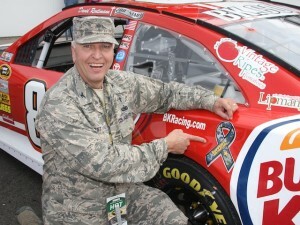 Chaplain, Colonel Steven E. West is an active duty United States Air Force Chaplain. He is a native of Alabama. In 1974 Chaplain West enlisted in the Air Force and was assigned as a Fuels Specialist. He served at Nellis AFB, Nevada and Eglin AFB and Duke Field, Florida. He was honorably discharged as a Staff Sergeant in 1980. In 1983 Chaplain West entered the Army National Guard (ANG) as a Chaplain Candidate, serving in Andalusia, Alabama; New Orleans, Louisiana; and Hattiesburg and Meridian, Mississippi. He pastored for 14 years while serving in the Army and Air National Guards until February of 1993 when he re-entered active duty as an Air Force chaplain. Chaplain West earned a Bachelor of Arts degree from Mobile College in Alabama. He attended New Orleans Baptist Theological Seminary, Louisiana, graduating in May of 1987 with a Master of Divinity degree. He also earned a Doctor of Ministry degree at Alabama Theological Seminary, Northport, Alabama, completing his dissertation while a chaplain at Eglin AFB, FL in 1995. Chaplain West has served as a Protestant Chaplain at Eglin AFB, FL; as hospital chaplain at Bolling AFB, DC; as White House Communications Agency (WHCA) chaplain; a Clinical Pastor Education (CPE) Resident at Walter Reed Army Medical Center, DC; Senior Protestant Chaplain at Kadena AB, Okinawa; Chief of Chaplains Office Resource Board, Maxwell AFB, Al; and Wing Chaplain, Whiteman AFB, MO before serving in his present capacity. He was deployed to Andoya, Norway; Port-au-Prince, Haiti; Taegu, Korea; and OPERATION IRAQI FREEDOM as Wing Chaplain at Balad Air Base, Iraq, 2007-2008. Chaplain West has completed the Army Chaplain Basic Officer Leader Course; AF Chaplain Orientation Course; Squadron Officer School; Clinical Pastoral Education; Air Force Institute of Technology (AFIT) at the University of Nebraska in Marriage in Family Therapy; Air Command and Staff College (non-resident); Air War College (non-resident); and Joint and Combined Warfighting School (JPME-II). He has received many awards to include the 2008 Air Force Association Chaplain Service Award; Bronze Star; AF Meritorious Service Medal with 3 oak leaf clusters; Joint Commendation Medal; National Defense Service Medal with star; Iraq Campaign Medal with star; Global War on Terrorism Service Medal; Armed Forces Service Medal; Humanitarian Service Medal; AF Commendation Medal and AF Achievement Medal. Chaplain West is endorsed by the Southern Baptist Convention. He and his wife Cherri have been married 33 years and have two children: Adam G. West and Jennifer F. West.